We’re turning Black Friday…Blue. It’s BIG. Last week I announced something BIG was in the works. The tweets and emails started pouring in. Were the Whittakers moving? Was I going to be opening for Justin Bieber in his upcoming world tour? I learned a truth a long time ago that I’ve pretty much built my life on. That is, If you want to do something great, you better find someone to partner with. And I want to do something great with my life. You. Me. Us, living big. 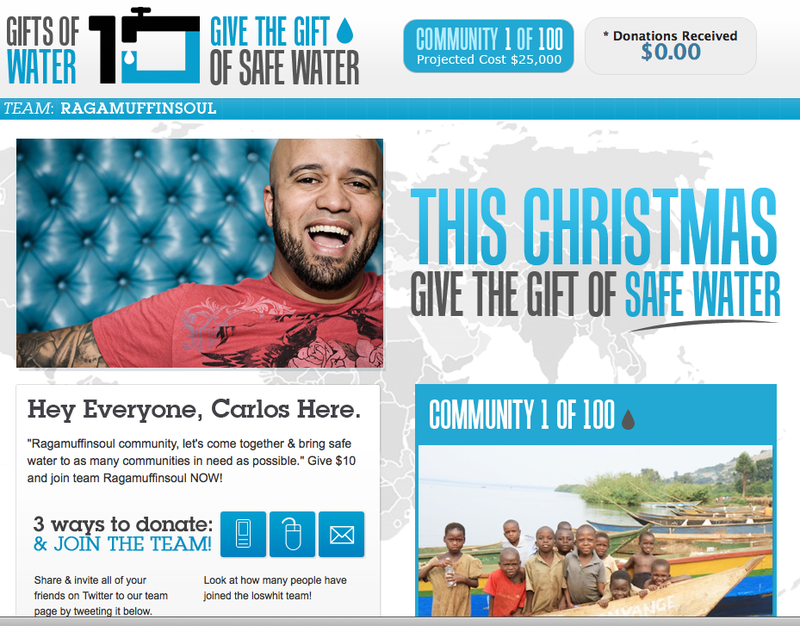 I’m excited to announce that RagamuffinSoul Community…we are the first team on Giftsofwater.com. Their plan is genius and they have completely set us up for a win. All it will take is a text to have $10 charged to your cell phone bill, then forward it on to your friends. Details on how to join my team and donate here. Starting this Friday, BLACK FRIDAY, we will be bringing the gift of life to as many communities as we can. For the next few weeks we’ll be hitting it hard. I’ll give you an update on how far we’ve come on Water Wednesday posts. What’s really rad about this? We get to watch direct video footage of the communities receiving their gift of water. You guys are rockstars. You are connected. You have friends. You have churches. Ragamuffin Community, more than iTunes success, Youtube sensations, we can leave our mark on 2010. And to my fellow bloggers…I’m challenging you to a throwdown. You can start your own team. So whether you’re gearing up to hit the stores Black Friday or Buy It Now on Cyber Monday, let’s get ready to save some lives.